← FEATURED: The New Droid Bionic! 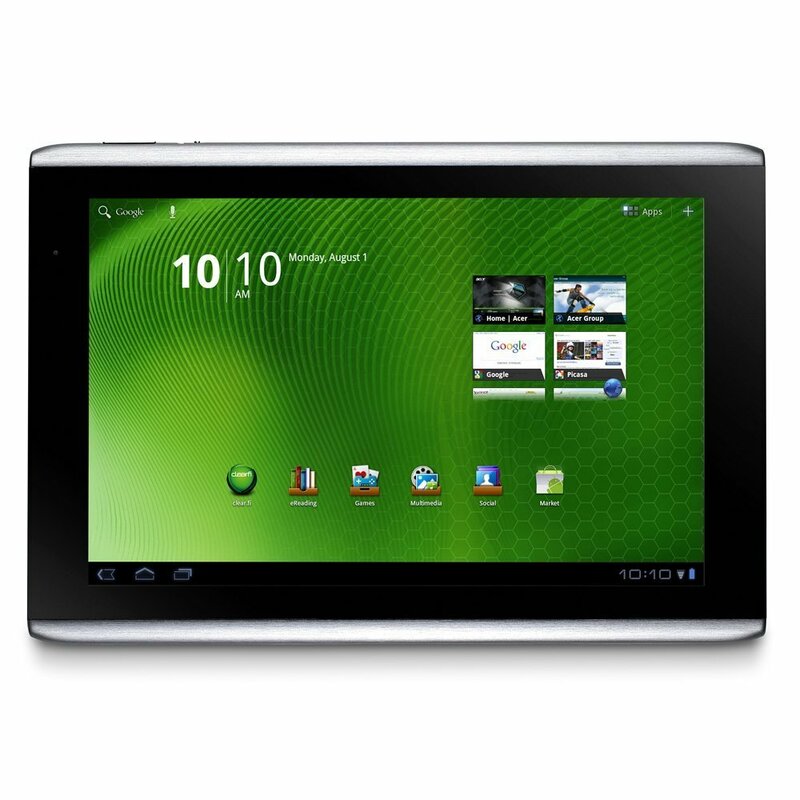 The Acer Iconia Tab a500 is a Android Honeycomb tablet and is priced competitively at 449 USD for a 16GB model. The Tablet is great for watching movies on the go or editing documents. Thanks to its Nvidia Tegra 2 dual core CPU which runs at 1 GHz makes activities a breeze such as playing games, watching HD video editing documents etc . The Acer Iconia Tab runs Android Honeycomb which is Google’s latest Android OS. Honeycomb introduced a new UI which is sort of has a holographic feel to it which we love. The down side of this is that not many apps have been made for Honeycomb since it is new, on the upside it has backwards compatibility which means you can run older apps such as ones from 2.2, 2.3 etc. Again this is vanilla Honeycomb which means there have been no custom skins over it, but a few apps are included such as NFS shift and an Office Suite. The tablets design is great overall with brushed aluminum accents on the back and a very glossy display on the front. But whenever we pressed on the edges we heard creaks so the build quality isn’t very good but it is acceptable. The tablet has a 10.1 inch 1280 x 800 screen which has amazing contrast and impenetrable blacks. It also has an HDMI port which allows you to mirror your tablet on to a larger screen which has an HDMI port plus DLNA support for sharing media content without having to connect to a computer. There are 2 cameras in this tablet one 2 megapixel front facing and a rear facing 5 megapixel camera with the ability to record in 720p, a LED flash is also included. This tablet is great for people who want to use it at home but not for those “on the go” as the tablet may break easily. Overall the tablet offers a zippy performance for a price that won’t make you empty your wallet. Posted on September 9, 2011, in Gadgets and tagged acer, android, honeycomb, iconia, review, tab, usage, youtube. Bookmark the permalink. 2 Comments. Thank you for leaving a comment, but this is my old blog. My new one is here : http://www.pyrito.com/ . You can check out the editing documents on the article on the other website.